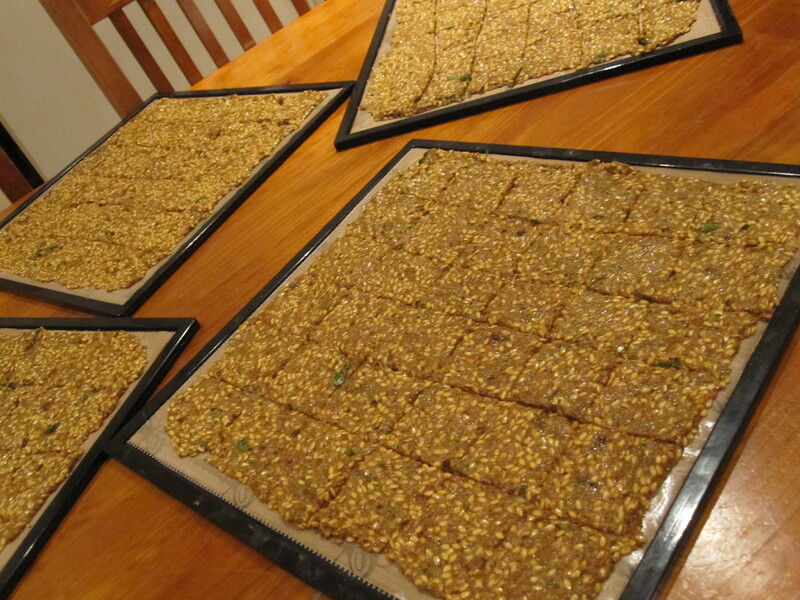 Flaxseed (or Linseed) crackers have got to be one of the essentials of a raw food diet. They replace water crackers when having dips… they add carbs and protein to salad meals and are perfect with a soup for a little dipping and munching. I am hoping mine, that are currently in the dehydrator, end up just as yummy as the ones we made in class. Takes a few days to produce these, so make sure you have your flaxseeds soaking overnight. I used golden flaxseed (whole) and the darker flaxseed (ground) for a bit of variety. This is a huge recipe that will produce about 150 crackers (or 4-5 trays). Put on to soak 2 cups flaxseed in 4 cups of purified water. Soak overnight and do not drain or rinse. Add the fresh herbs and pulse. Batter should be smooth with flecks of herbs. In a large mixing bowl, transfer the vegetable mixture and add in the flaxseeds and ground flaxseed and stir well. Spread about 2 cups full evenly on a lined dehydrator tray and smooth over the tray as thin as possible (about 4ml). Score the mixture into 6 x 6 squares (36 per tray). Dehydrate for 12 hours at 115 degrees Fahrenheit until dry enough to turn. Flip crackers onto mesh screen and continue to dehydrate for 24 hours until completely dry and crisp. Cool completely and store in a sealed container for 3 months. Can also be frozen for 6 months.